Last year for the Super Bowl, we re-ran a post from 2011: Top 10 Lessons Authors Can Take from Watching the Super Bowl. Here’s the thing … neither my husband nor I are huge fans. We’ll be watching, but we’re anything but rabid followers. And since Marcie has followers and readers all over the globe, I’m sure there are some of you out there who are even less interested in American football than we are. Nevertheless, it’s good to be able to go where the crowds are. If you can find a way to tie your book to the Super Bowl (or topic du jour), by all means, get in on it! But you’ve got to do it with some aplomb and grace. 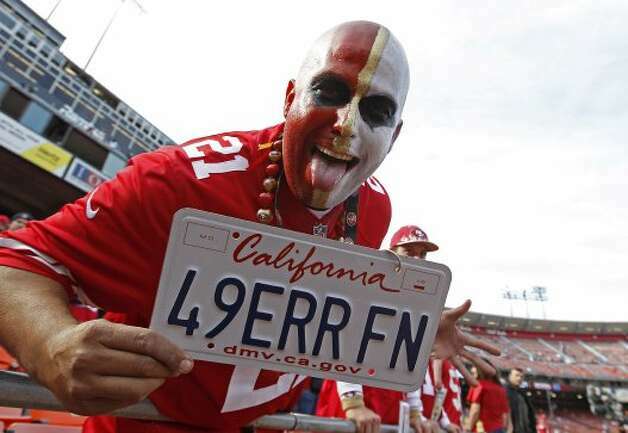 If you’re forcing the topic, it might simply be better to make the Big Game the focus. 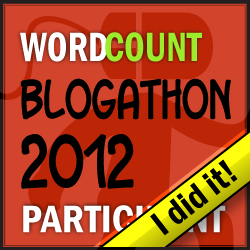 Here’s the thing to keep in mind: every Facebook post, Tweet, or blog needn’t be about your book! In fact, if all you ever write about is your book, you may bore people. Your interest in the Super Bowl, Valentine’s Day, or the latest season of American Idol gives you something to write about other than your book, creating the appearance of a well-rounded author – not an author whose every waking utterance is in promotion of your book. Keeping in mind the 10 Lessons from last year’s post (BELOW), what clever, creative, or interesting observations about today’s game can you make on Facebook, Twitter, or your blog? Sure, everyone else may be commenting, too, so what do you see or notice that’s a little different? And how can you extrapolate this to life at large? How can you bring details from your ski vacation into your marketing efforts? Grandma in the hospital recently? Did you learn something from that experience that could benefit your online audience? Make chocolate chip cookies with your little ones recently? How about sharing your recipe or memories from your own childhood with your readers? The idea is to be relatable. Tell stories that make you, the author, a real person to your readers, friends, and followers. It takes guts and conditioning to make it to the top. The best team doesn’t always win. Getting on the field and making it to the endzone … two entirely different things. When you fall down, get up quickly. Get creative with your advertising. Happy Super Bowl Sunday! If you accepted the Challenge, come back and share your posts with us in the comment section below! Take a page from the Boy Scouts: Always be PREPARED! So now that we’re familiar with relationship marketing as it pertains to becoming an SBM* and have made that aspect of selling books part of our daily ritual, practice, and mantra, it’s time to start seizing the opportunities as they present themselves. I recommend taking a page out of the Boy Scouts’ playbook and always BE PREPARED. Once you train yourself to recognize them, you will begin to notice opportunities everywhere. You will meet people in line at the grocery store or the DMV. 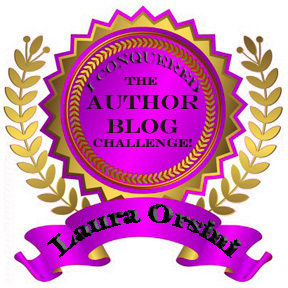 Your spouse will come across someone who can help promote your book. You will attend a lecture and make connections who invite you to speak the next time. Whatever shape or form they take, make sure you’re ready to capitalize on these limitless opportunities! It’s possible that right now you’re thinking, “What are you talking about, Marcie? I’ve NEVER met anyone who could help me market my book on Irish vegan wedding recipes.” Here’s the thing: the opportunities are out there, but you must learn to see them. I decided exactly what I wanted. I figured out the kinds of help I would need to get there. I learned to be a better listener. I got over my fear of talking to people about my products and services. Think about the times people have asked you for help. If the request is reasonable, people are mostly willing to help. Now there’s one big caveat here: you do NOT want to go at people with your hand out the second you meet them. This is not about learning to use or manipulate the people you know. It’s about figuring out how to create mutually beneficial arrangements with them. Nothing will come of any of the opportunities, though, if you aren’t prepared to leverage them. How are you at public speaking? 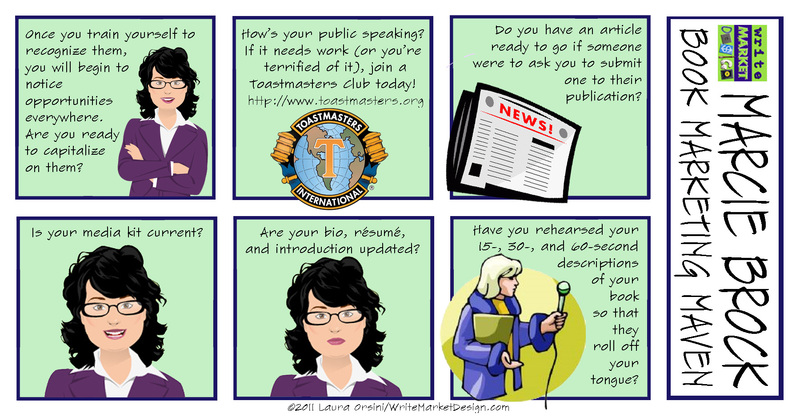 If it’s less than stellar (or if you’re terrified of public speaking), join a Toastmasters Club today! Do you have an article ready to go if someone were to ask you to submit one to their publication? How’s the resource box and your call to action? Is your media kit current? Are your bio, resume, and introduction updated? Have you rehearsed your 15-, 30-, and 60-second descriptions of your book so that they roll off your tongue? 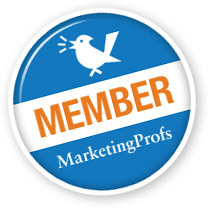 Thursday, June 16 – Are you using the 80/20 RULE when it comes to marketing your books? RELATIONSHIP marketing is the only way to SELL something personal like a book. The answer is: BOTH of these things! Relationship marketing is the best way to sell anything, especially something personal like a book. Don’t think a book is personal? Think again. It’s one of the most personal products in the world, because in most cases, a single person created it. Not a business. Not a larger corporation or massive entity. One person, who is probably a lot like his or her potential readers. Marketing can be defined as the process of introducing and interesting potential buyers in your products or services. So, Savvy Book Marketing is the process of introducing YOUR BOOK to your clearly defined TARGET audience (i.e., people who want to BUY and READ your book). We talked last time about how companies used to use advertising as their key means of launching a product. Companies used to rely almost exclusively on a sales strategy to create demand for their products whereby they essentially chased customers, “pushing” their products/services at prospective buyers. Relationship marketing has turned that old style of selling on its ugly little head. Today, the kind of selling that works best is “pull marketing,” campaigns that draw buyers (a.k.a. readers) to you by engaging them, getting to know them, creating RELATIONSHIPS with them. 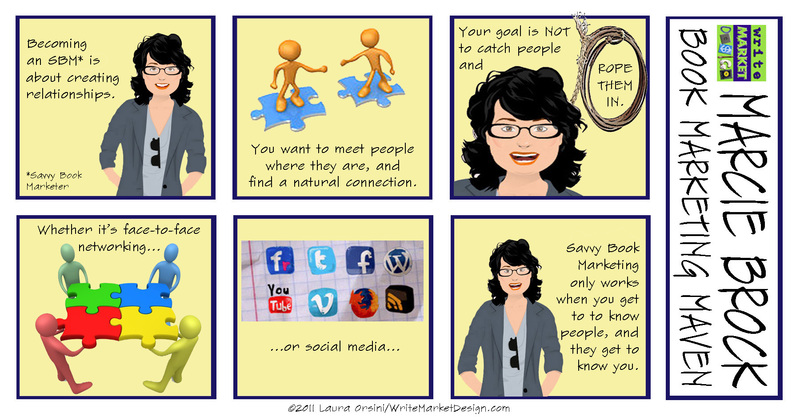 However, once you engage and connect with them, your goal is still to SELL your book to them. to connect and create relationships with them? If you’re feeling bold, share your comments below. (As an SBM* or an SBM-in-Training, I sure hope you’re getting bolder!) This isn’t all about me lecturing you. I know we’ve got some very Savvy Book Marketers* out there with great ideas we can all learn from. Savvy Book Marketing is always about the RELATIONSHIP. It would make my little Savvy Book Marketing heart sing if most people who read the headline on this post think, “Duh!” But I’ve found that whenever it seems like everyone should know something, that’s the perfect time to reiterate the point. Let’s start by taking a trip in Marcie’s Time Machine. Buckle up, ’cause here we go. A l-o-n-g time ago, when there were many fewer mediums than exist in today’s hyper-connected world, it was enough for a company to launch a new product with an ad on the TV machine or the radio box. Fewer companies + fewer ads = lots more attention paid to each product featured. Today, it’s estimated that we come across between 3,000 and 5,000 marketing messages in a single DAY. Think about it: license plates and frames, sides of cars and trucks and buses, bus stops, real estate signs, billboards, product placement in movies, let alone radio, TV, print media, and the Internet. Here’s the thing: Ads might amuse us, but what they don’t do is cause us to connect with the company/service provider. That’s where the relationship comes in. And that’s what you want to start thinking about as soon as you begin writing your book. Who will read it – and how can you create a connection with them? 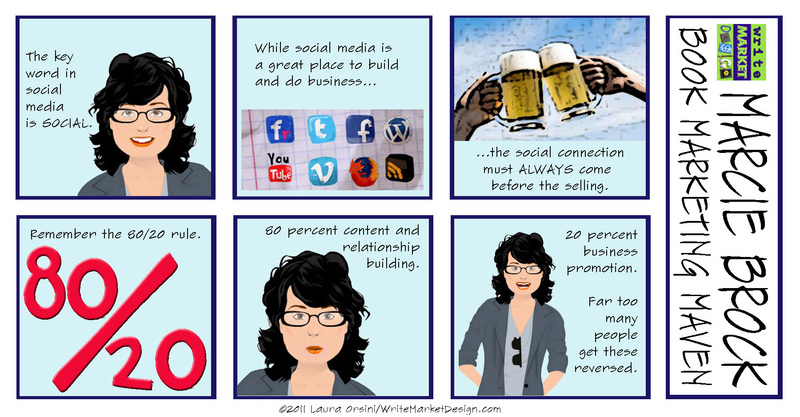 Social networking isn’t about selling – remember to put the emphasis on the first word: SOCIAL. 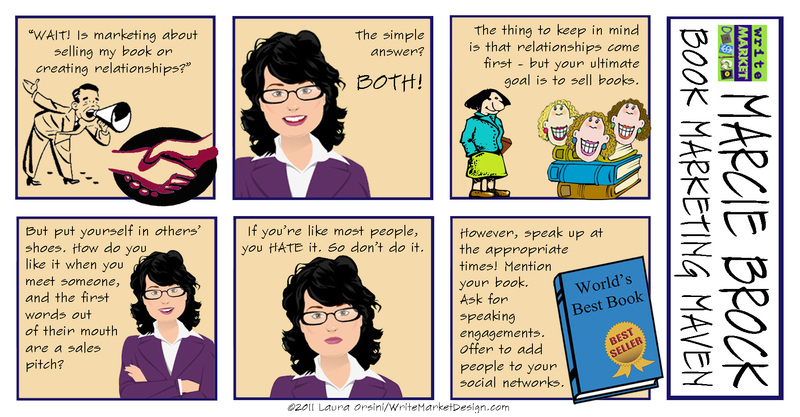 Do the same in your face-to-face networking and with your e-mail list. Notice the individual. Use Twitter to get to know agents and publishers – WITHOUT asking anything from them. Send birthday, anniversary, congratulations, and most importantly, thank you cards. Respond personally to people who reach out to you first. Cultivating the relationship is the single most profitable thing you can do to market yourself as an aspiring author.